Utilizing a completely in-house engineering service we offer a wide range of solar PV systems and have proven capability across a wide range of applications. *Production Guarantee for all SMA, Fronius and Enphase inverters with Trina or LG panels. *3 day Service Guarantee or we refund your lost production. *Swiss-German isolators manufactured by ABB with roof penetrations by Decktie and Sikaflex. *Established in 2008 – We know the value of our warranty. We have put a lot of logging in the field, and some of it has been running for several years or more. This allows us to constantly decrease service issues and accurately model long-term outcomes. With that in mind, our very best job is most likely the next one! Our systems are comprised of quality solar PV products based on extensive installation experience. 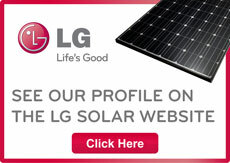 We recommend solar panels from LG Energy or Trina, with inverters by Enphase, SMA or Fronius. All carry long-term realistic warranties that you can trust. Our PV systems are installed to stringent design requirements ensuring maximum efficiency and therefore your return on investment. We provide a detailed production report which shows your output over the course of a ten year investment period. This production is then guaranteed throughout the warranty period, which further underlines our confidence. Ask your comparable quotes how they deal with some of the most common installation problems such as roof penetrations and fixings. We utilize only the most durable products such as Decktie, Sikaflex, ABB, Hager and Schneider Electric. We can give you 10 reasons why Ecoelectric are the best provider for your solar system! Are you looking at financing a solar system? Are you aware that your overall cost of electricity including repayments can reduce from day one? Do you want to immediately start saving money or lock in a long-term investment? Ecoelectric can finance your solar system through one of our providers and ensure you start saving from day one! Like to know who youre dealing with? Check our director’s Linkedin profile here, or take a look at some of our previous installations. We have nothing to hide and pride our after sales business around ongoing service and feedback. Request a free quote from Brisbane’s leading solar design and installation services or browse our online shop for a variety of design matched systems ranging from 2kW right up to 100kW in ground mount.